Stockton started the game against a strong Seaton side brightly and took the lead when some good work by Archie found Owen who made the score one nil to the Yellows. Seaton equalised soon after and the game was now becoming a physical encounter. Stockton again took the lead when Kian received the ball out on the right and he played a well weighted pass into Georgie who finished brilliantly. Two quick fire goals from Seaton swung the game in their favour which was now becoming a brilliant game to watch. Oliver was making some brilliant strong runs down the right and was rewarded when he found Kian unmarked who levelled the scores, Oliver was then involved again when he put Georgie in on goal who made no mistake the make the score 4-3 to the Yellows at the break. Stockton knew the game was far from over against a big Seaton side and soon found themselves 8-4 behind after some good strikes from the Seaton striker. Oliver then got the goal his performance deserved after some good work from Owen to give the Yellows a lifeline. Another good strike from Seaton made it 9-5, Stockton kept going though and when Archie found space on the left he played in Owen who scored his second of the game. The game was a real thriller and could of went either way, Seaton took this one though after some brilliant strikes, Stockton will get their chance for revenge when they play Seaton in the cup in two weeks time. 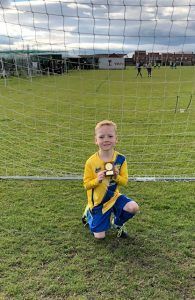 Todays player of the match was Owen who has been consistent all season and managed to add another two to his tally today.